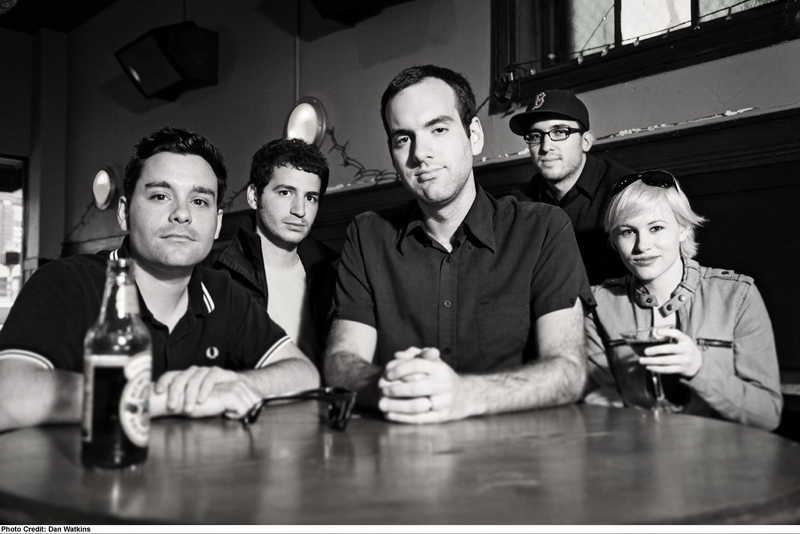 New Collisions is a five-piece power pop band hailing from Cambridge, MA. Consisting of Sarah Guild (vocals), Scott Guild (guitar), Zak Kahn (drums), Casey Gruttadauria (keys) and Alex Stern (bass/vocals), New Collisions is quickly gaining popularity. The band was founded by Sarah and her husband, Scott in the Spring of 2009. They collaborated on songs with Alex and Zak and later met Casey. They began playing the Boston scene and that got the attention of The B-52s, who asked New Collisions to open for them. The success of that tour led to them opening for Blondie, whom are listed as their ultimate influence. During this time many record labels began to approach them as well as former Cars Keyboardist, Greg Hawkes who is featured on their debut EP, Invisible Embraces. They apparently sent him a message on Myspace and he wrote back (at least Myspace is still alive for musicians!). Their debut LP, The Optimist was recorded in under ten days and was released in October 2010. It was produced by Sean Slade and Paul Kolderie (The Pixies, Radiohead, The Sounds). The band describes their music as, “a mixture of raucous, late 70’s punk, some early 80’s influences with some influences like The Pixies, The Jam and The Clash”. In such a short time, New Collisions have made a name for themselves. Their song “Afterglow” was the lead track for Charlotte Russe’s summer denim campaign. CMJ’s publication included them on a CD sampler that included only 20 bands out of the 1,000 bands who played the festival. Their national tours include opening for: Missing Persons, The Morning Benders, You Say Party! We Say Die! and The Constellations. The band is finishing 2010 with a tour of the southeast. This marks their sixth national tour. You would think they would take a break, but not this band; they have already booked a studio and have tapped Sean Slade once again to work on a new release, an EP due out March/April 2011. They have also alluded that Greg Hawkes may be featured once again by mentioning on their blog that “a certain famous synth player may also be involved”. Definitely check out their debut LP, The Optimist and be sure to watch their video for their single, “Dying Alone” on their official website. For more information on New Collisions visit: www.newcollisions.com.